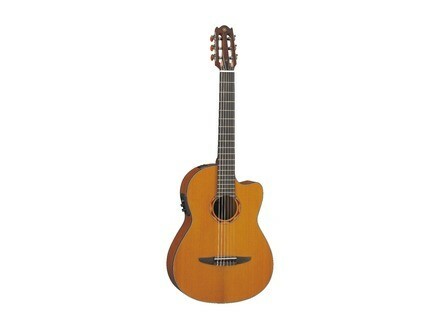 NCX700C, Acoustic-electric nylon string guitar from Yamaha in the NCX series. Yamaha debuted at NAMM 2014 two new nylon-string electric guitars. The NCX700C features solid cedar on the top board with nato back and sides, 94-100mm body depth, rosewood fingerboard on a nato neck, System 61 A.R.T. 2-way pickup system, and rosewood bridge. For its part, the NTX700C has a cedar top board on a classical-style body with 80-90mm depth, cutaway and nato back and sides. It further features a nato neck, 14th fret neck joints and the System 61 2way A.R.T pickup system. The NTX700C is available in two finishes: Natural and Brown Sunburst. Pricing and availability haven't been disclosed yet. [NAMM] Yamaha A1FM and AC1FM acoustic guitars Yamaha launched at the NAMM Show 2014 limited edition models of the A1 and AC1 acoustic guitars. [NAMM][VIDEO] Exclusive Palmer Blutsturz demo Palmer have done us the honor of introducing Blutsturz, their new tube amp head for guitar, at the NAMM Show 2014. [NAMM] Peavey VYPYR Pro and Sanpera Pro Peavey debuted several new products at this year's NAMM, including the new VYPYR Pro guitar combo and the Sanpera Pro footcontroller.